Nothing could be better than meeting up with religious school or day school friends for some added fun! Join one of our WBTY Youth Programs - WBTYdeux for Grades 4-5 and Jr.WBTY for Grades 6-7. Events include our annual retreat, a Havdalah Pajama-Rama, bowling, skating, rock climbing, laser tag, and so much more. Brawerman Elementary School offers a rich, personalized academic experience to students in grades K - 6 on two campuses in the context of a warm, nurturing and creative community. Wilshire Boulevard Temple’s Religious School is a Jewish home away from home, committed to providing a joyous experience of fun and learning throughout a child’s kindergarten through high school years. Our ultimate goal is connecting students to Torah, traditions, and customs while ushering them into this vibrant, welcoming, community. 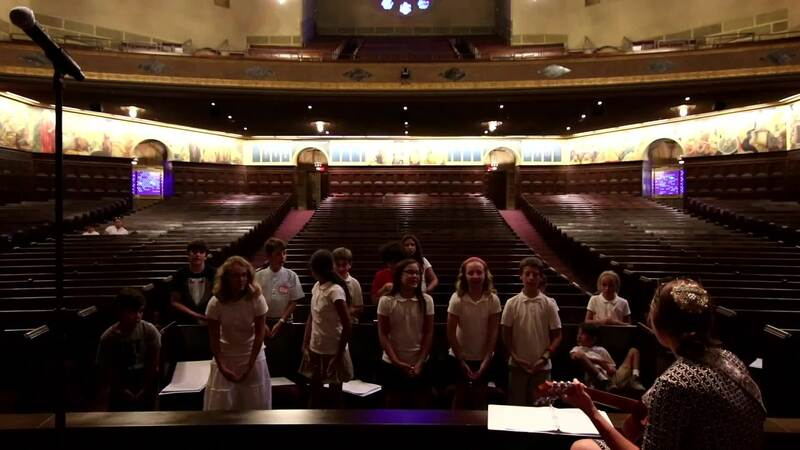 As a beloved feature of our Shabbat Music Services, the WBT Youth Choir is open to singers in Grades 2 – 6. Come celebrate music and song with others who love raising their voices. Under the direction of Cantors Don Gurney (Irmas) and Lisa Peicott (Glazer), Youth Choir members learn a wide variety of traditional and contemporary liturgical songs and inspire us all with beautiful solos, duets, and choral offerings at Shabbat services/Holiday celebrations. Jam out with our rock band, Brawerman East and Religious School "Shir Joy" Youth Choir, and our "Cantor's Club" teen choir (grades 7+), as they lead our community in a family-oriented service. This sing-along service invites the entire community to join in as we celebrate Shabbat together at Glazer Campus. The second Friday of every month during the school year. Rehearsal - 5 to 5:30 p.m.
Pizza Dinner - 5:30 to 5:50 p.m.
Services begin at 6:00 p.m. and end at approximately 7:00 p.m. Dress code: dark bottoms and a white top. Brawerman West (Irmas): Fridays from 3 to 3:30 p.m. The camps are designed to help youth develop personal identity and self-esteem, build relationships, learn about Judaism, and increase their long-term commitment to their families, synagogues, and communities. Our camps provide a variety of athletic, artistic, and recreational activities though a combination of elective and age-specific programming. The daily routine is uniquely Jewish. Prayer is a component. Meals are blessed. Many of the songs we sing are in Hebrew or have Jewish content. While knowledge acquisition is valued, our primary goal is the deepening of identity and commitment. Jewish engagement doesn’t end after B’nei Mitzvah and we have so many opportunities for teens to stay involved! Whether you are looking for something on a regular basis or less frequently, academically-focused or more socially-oriented, something that pays or a program geared toward giving back, there is something for everyone.